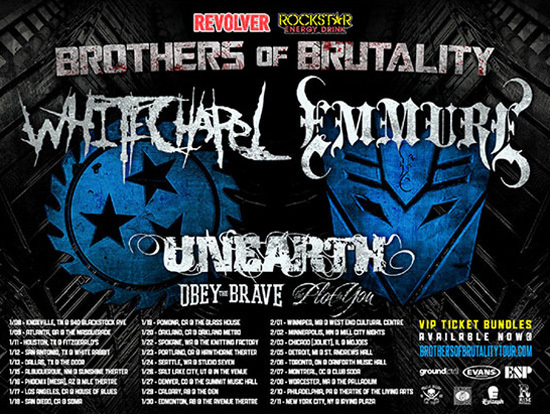 UNEARTH will begin 2013 in a big way on tour alongside WHITECHAPEL and EMMURE. The “Brothers of Brutality Tour” will begin on January 8th in Knoxville, TN and wraps up February 11th in New York, NY. Unfortunately, UNEARTH bassist John “Slo” Maggard will not be joining the band on the tour. “John “Slo” Maggard will unfortunately be sitting out the Brothers of Brutality Tour (Whitechapel, Emmure, Obey the Brave, The Plot In You) this coming January/February. His absence is simply to take care of personal matters at home and is only temporary. Slo will remain a member of Unearth moving forward and is actively involved in the writing process for our next album, which we plan to record and release some time in 2013. “I couldn’t be more excited to be filling in on bass for my long time friends in Unearth on the upcoming Brothers Of Brutality Tour,” DeVries said about teaming up for the tour. “They are like family to me and I’m extremely happy to step up to the plate for my good buddy Slo!